An exciting opportunity to meet, learn from and experience healing with a renowned Shaman, spiritual teacher and healer who is visiting Australia from Peru. Cancellation policy for this lecture: Refundable – less 15% admin/bank fees if cancelled 30 days before the workshop or 50% refundable less admin/banking fees 7 days before the event. No refund 7 days or less before the event, during or after the event. In this lecture Silvia will explain extensively about the layers of the Chakana, the Andean cross. She will expand on its symbolic meanings, including the significance of Amaru, the snake, as symbol of the purest, original, feminine energy. In her perspective, feminine power and energy is of major importance in this time and she will explain why this is the case. Understanding these powerful symbols is crucial for any healer in the Andean tradition. In this workshop Silvia will teach you about the ancient path of the Aymara, AYMARÁ THAKY in her language. 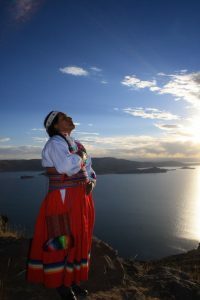 She will teach you how and when to do ceremonies to connect with the spirit of the coca leaves, Inal Mama, with the spirit of Mother Earth, Pachamama or Kolla Mama, with the spirit of your sacred place, your Huaca, and with the spirits of the mountains, called Apus or Achachilla. Depending on the time she will also teach you how to connect with the spirits of the elements water, fire and wind and the spirit of light. To learn about these ceremonies, as a way of asking permission to the spirit world, is a requirement to do any kind of healing work. She will also talk about the Seven Temples that are the steps for self-healing. This is important because we can heal ourselves through our beliefs. The workshop is suitable for both men and women. Friday 23rd. 9am-3pm. St Kilda. Monday 26th. 2-5pm. St Kilda. Tues 27th. 9am to 5pm.St Kilda. Wed 28th. 9am to 5pm.St Kilda. Prices: 30 minutes coca leaf reading $75. 1 hour coca reading and some healing $125. 2 hr healing sessions (recommended for people with serious conditions) $250. 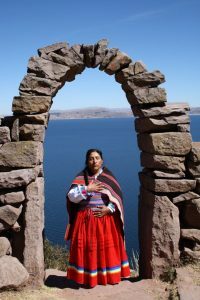 Silvia Calisaya Chuquimia is a traditional Aymara healer descended from the pre-Inca people who still inhabit the southern Lake Titicaca region in the high Andes. Born and raised in a small highland village, she left as a young woman to pursue her education and a professional life, and later returned to the traditional teachings of her people. 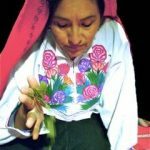 She is an expert at the ancient art of reading coca leaves for divination and healing, and is the proprietor of the Coca Leaf Museum in Puno, Peru. Coca is a sacred plant for the inhabitants of the Andes, still held in veneration among the indigenous and mestizo peoples of South America.